Do not over exercise your pup. 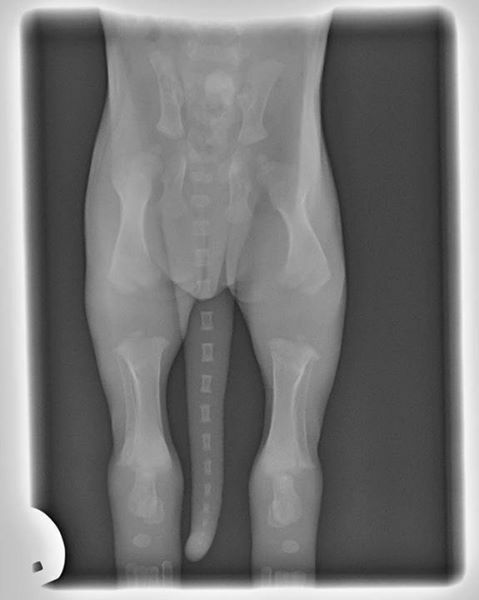 This is an X-ray of a puppy at 2 weeks old - just look to see how far the bones have to grow to just become proper bony joints, let alone become strong articulating joints that have correct feedback into the brain... this is why it is imperative that we don't over-exercise our puppies, and certainly not jump them or train them too hard before they are fully developed. This is different age categories for different breeds, and if the dog has had any specific problems during it's puppyhood. Please be careful at this stage so the dog's joints will last well as they age! X-ray used with permission from Emerald Chiropractic.